Senior captain Kevin Quinn embracing his teammates. Will They Relive Another Memorable Season? 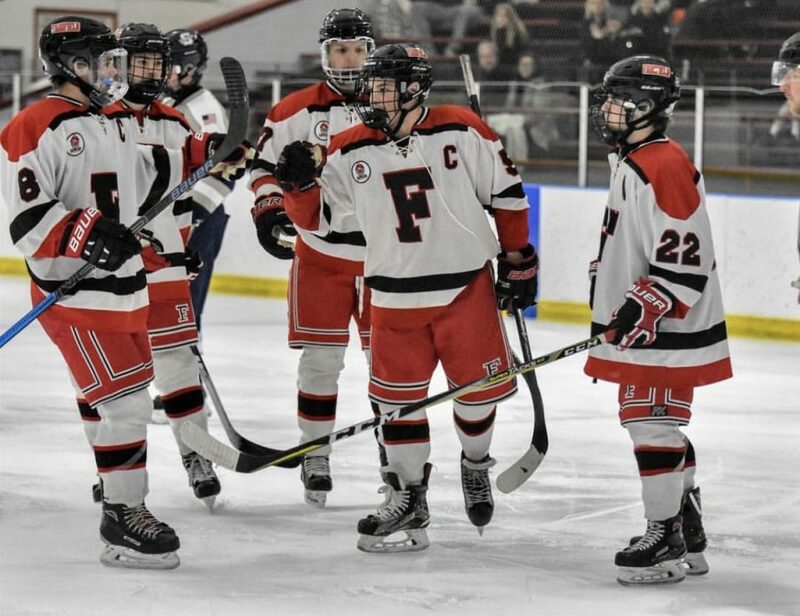 As the Fairfield boys hockey season rumbles to a start, many wonder if this will be a winning season. Over the past few years, Fairfield boys hockey has accomplished successful seasons. After making it to States in the 2016 season as well as last season, the boys have a lot to live up to. The struggle for success in the past years has been due to communication and weak team play. Now with few seniors, the struggle has shifted towards size and experience with many underclassmen seeing ice time. “We have a lot of freshman and sophomores stepping up and filling in big spots to help us succeed,” adds senior captain Kevin Quinn. Senior captain Kyle Mazza agrees and feels optimistic about the future of this young team. “They’ve got a lot of team chemistry from playing together at the club team over the fall. “Having some very talented sophomores is really good because they will be with us for the next few years,” says Larouche. The boys aren’t very phased by the first two losses of the season, “I am pretty confident about the current record because everyone knows we could be 5-0, but in the end, it all comes down to FCIACS”, says Quinn. But the loss of senior goalie Will Capalbo for a number of games is definitely going to affect the team without him in net, and mentally. “Losing Will means everyone needs to step up, given that we have a young goalie behind him with little experience and much to learn”, says senior captain Kevin Quinn. “Will is going to be with us for another week to be able to play the New Cannon game, but then we’ve got Jordan Verchin and John Grace. I know we won’t be as strong without Will, but we will be fine with Jordan and John,” says Larouche. “To be in this league you need to have skills, but you also need to have character. Aside from that, I feel the team needs to have a bit more poise,” says Larouche. It all starts in practice where they work to pull all of their strengths together. “We do more conditioning than any other team in the school”, says Quinn. “It’s all about the friends you make and having fun, the score is just a plus that comes with it,” says Mazza. The team is especially grateful for their workout facility within their rink where they have the opportunity to bond and work with their professional weight trainer and improve their game as much as they can. On the other hand, the three coaches: Coach Larouche, Mongillo, and Coach Dave have been working their players to the best of their ability. “Our coach has a motto to play the best players and everyone gets benched at one point or another because it makes kids work harder for a position,” says Quinn. With big games up ahead, the boys are eager to keep the train moving.